Fresh herbs in your cooking cut just when you need them sounds like a terrific idea? It is! The easy vegetable/herb garden kit gift is a useful and healthy housewarming gift. If the new home owner loves gardening but stays in an apartment without any backyard or garden, then the compact indoor herb garden gift set would be just great. Some of these vegetable herbs growing kits for the kitchen or garden come with self watering feature which makes it super easy to take care of them. With the complete setup included in the kit (planter box, potting soil and seeds), starting your fragrant and delicious herb or vegetable garden is easy. It is indeed a fun and rewarding pastime. Growing your own herbs contribute to tasty, healthy and nourishing meals. You get to use the freshest and most flavorful herbs for your cooking or salads, minus the harmful pesticides. 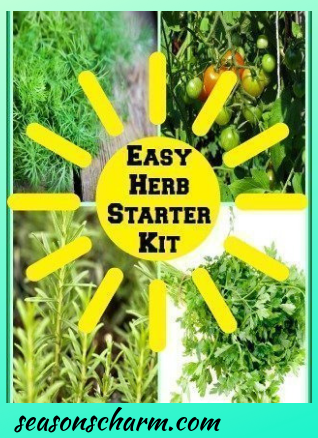 It is easy to grow as these starter kits come with all the necessary parts to start an edible garden. The vegetable herb garden kit is indeed a thoughtful gift for home cooks and a good gift for gardeners. 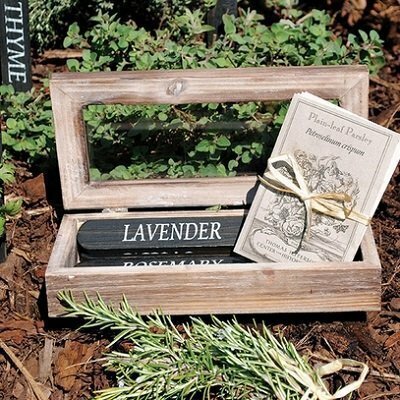 The outdoor or indoor herb garden starter kit is truly a great housewarming gift. A vintage style rustic cedar box with 10 sections for keeping seeds, it comes with a glass lid. 10 different types of seeds from the Thomas Jefferson Center for Historic Plants are included with the box. The box measures 6″H x 9″W x 6″D. 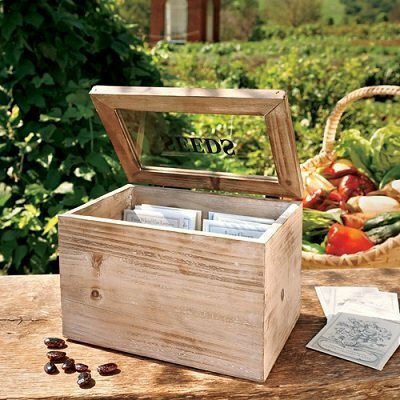 Yes, your gardener friends would be most impressed with these Heirloom seeds and the vintage style glass lidded storage box. They will have a great time growing these delicious plants. The rustic cedar box has a hinged glass lid. Included with the box are nine heirloom seed varieties from the Thomas Jefferson Center for Historic Plants, herbs that are often used in home cooking. 9 wooden stakes are also included. These come with the names of the herbs on them. The cedar box measures 8 3/8” L x 3 7/8” W x 1 3/4” H. Stakes are 7″ L x 1” W.
The whole kit consists of a rugged natural burlap bag and Brandywine tomato seeds. The 20 gallon burlap bag comes with reinforced drain hole and water retention coating. 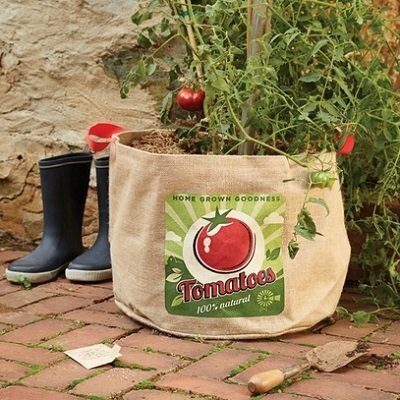 Fill the bag with potting soil and start growing your tomatoes. The bag has a height of 14.5″ and a diameter of 20″. This would be great for those without gardens. You can easily grow the tomatoes on your balcony or deck. 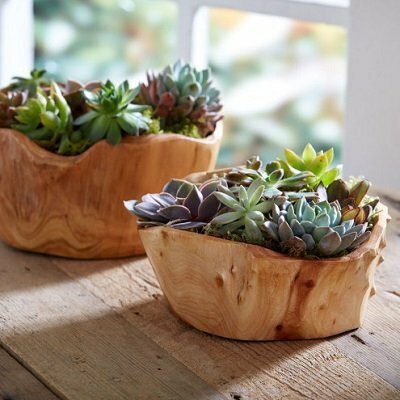 Charming rustic bowl hand carved from the salvaged root balls of Chinese fir trees and planted with succulents makes a lovely gardening gift for dad, mom and anyone who loves gardening. The bowl of succulents can be placed indoors or outdoors. Avoid direct sunlight and excessive moisture. These bowls of succulents look lovely sitting on your kitchen windowsill, adding a kind of countryside charm to your kitchen decor. The bowl measures 4.5″ in height and 8″ in diameter. This self watering plant with trellis comes with 2 wheels and a handle that makes it easy for you to transport it around your garden. This means that you can also put this durable polypropylene planter on your balcony or patio. Yes, you can have home grown tomatoes even if you do not have a garden or backyard. It comes with an extra-large 3-gallon water storage zone with a self-watering pot. This makes it easy and convenient as you do not have to worry about watering the plants ever day. You can put in 10 gallons of potting soil. 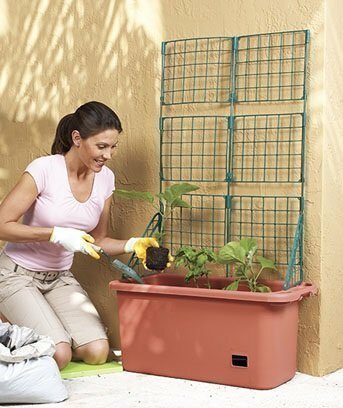 It measures 51″ x 29-1/4″ x 13-5/8″ with trellis attached. Cooking with homegrown tomatoes is such a great idea. You can hang this clay herb planter kit indoors as long as it gets the sunshine. The kit consists of 4 stacked deep brown jars (each jar measures 3″ diameter, 5″ H) with handles. The jute rope for hanging, soil as well as 5 types of herb seeds are also included. The 5 included popular herbs are sweet basil, coriander/cilantro, oregano, extra triple curled parsley and thyme. 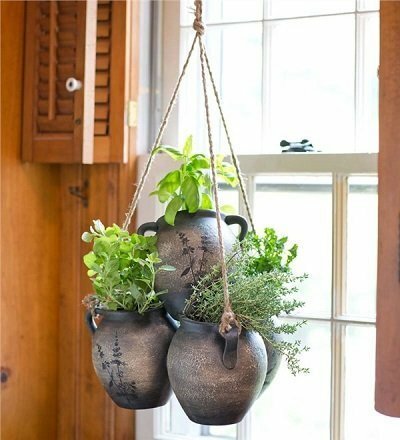 With this planter kit hanging in the kitchen, getting fresh herbs for your cooking is so convenient. Not only gardeners, but home cooks will love this kit too. Plants need water, light and nutrients to flourish. Now, wouldn’t it be great if all these 3 needs are automatically taken care of by itself? Good news – the smart garden is able to do just that. The smart garden set comes with patented smart soil with built-in sensors that will make sure that your plants get the optimal intake of nutrients, water and oxygen. A modular lamp arm design with built-in LED lighting and timer eliminates the need to have the plants exposed to sunshine daily. The enhanced light spectra is great for plant growth. The inbuilt 1.2 liter water tank ensures sufficient water for a whole month. This smart garden set is great for those who would love to have an indoor vegetable or herb garden that is relatively maintenance free. You can grow the whole year round, even in the midst of an extremely cold winter.